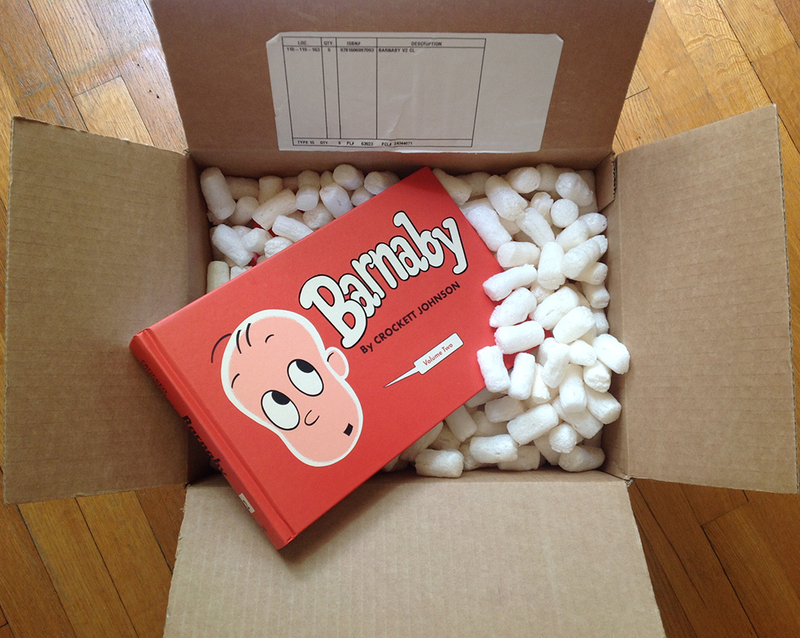 Crockett Johnson’s Barnaby Volume Two (1944-1945) is here! As we did in Barnaby Volume One and will do in the remaining three volumes, we’ve reprinted a different original strip for the front and back endpapers. I say “we” as if I designed it. I didn’t. Daniel Clowes designed the book — he’s designing the whole five-volume series. One of the things I really enjoy about working with Fantagraphics, is that their production team (Tony Ong and Paul Baresh, for the Barnaby books), Eric, and Dan all keep me in the loop. So, I get to see the interiors as they take shape, hunt for additional images to keep the layout interesting, and so forth. Jules Feiffer wrote the foreword to Volume Two. 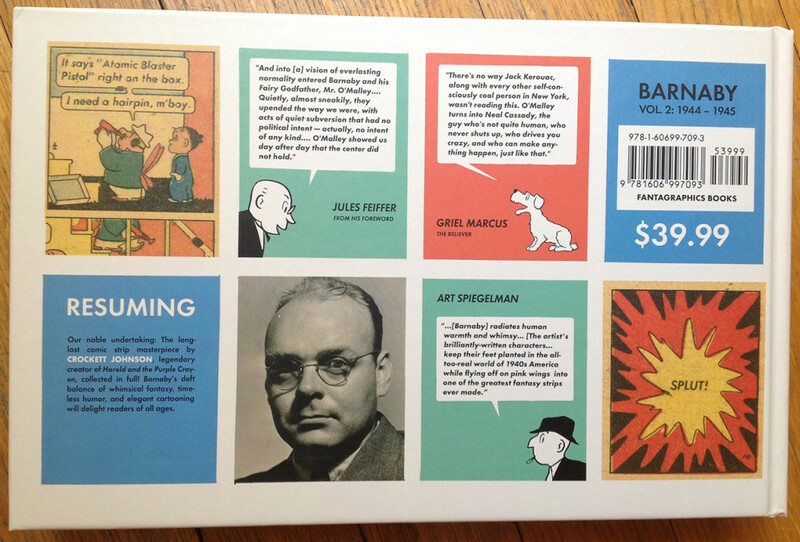 And Chris Ware wrote the foreword to Volume One. How cool is that? Each book also features a scholarly introduction: Jeet Heer (for Volume One), R.C. Harvey (for Volume Two). Johnson hits new creative peaks during 1944-1945. It’s one of the strip’s most inventive periods. If you enjoyed Volume One, you’re in for a treat in Volume Two. I wrote an Afterword and Notes for each volume. Do you need to read the notes? No. Barnaby is a topical strip, but the art, narrative, and fantasy sustain it. You can read it without knowing all of the allusions. However, I’m the sort of reader who, when reading Fantagraphics’ Krazy & Ignatz series, always checked the “Ignatz Debaffler Page” at the back of the book. I wrote the notes for people like me — people who like endnotes. If you don’t like endnotes, then skip ’em! In addition to the photo of Johnson and blurbs from Art Spiegelman and Greil Marcus, the back cover also offers a glance ahead to Volume 3, in which we’ll reprint a few color Sunday Barnabys. We only have a contract for the black-and-white dailies, but we thought readers might like to glimpse just a few of the color Sundays. In Volume 4, we’ll also have a few Sundays — they ran from 1946 to 1948. The three concluding Sunday strips offer a different way of ending Barnaby. So… stay tuned! I am so happy that the complete Barnaby is being republished! My parents were huge Barnaby fans and the first hardbound books were part of my childhood. In 1946, my father was sent to Japan while in the Army, and several loveletters sent to my mother in New York mention Barnaby, as in “For God’s sake, keep sending Barnaby!”. Of course I read the endnotes, which I greatly enjoy, and was surprised you didn’t catch the Cigar Store Indian; but I’m glad it has since been correctly identified. I’m eagerly awaiting the next volumes!